Advertisements are everywhere. TV, radio, billboards, websites, phone apps – you’re bombarded with consumerism. It’s unavoidable and exhausting. But, then you stumble upon an advertisement from the past. Everything changes and nostalgia washes over you. A simple, silly ad acts as a time machine, transporting you back to a long lost memory. Suddenly, consumerism isn’t so bad. It becomes a time capsule – preserving pop culture from the days you remember fondly. 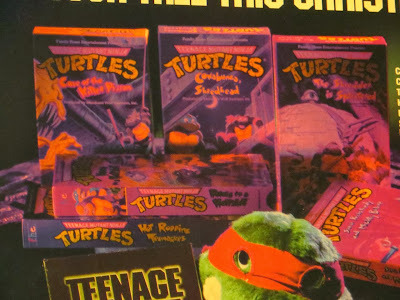 The Turtles were pop culture kings and advertised in every avenue possible. When the holidays came into their view, they didn’t slow down. 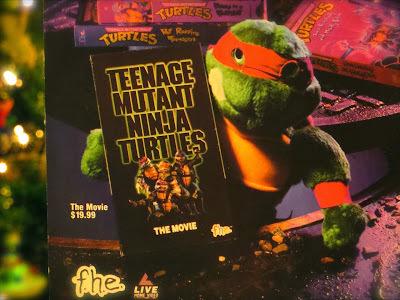 This ad printed in an early 90’s magazine screams nostalgia with a classic plush Turtle toy and a slew of VHS tapes. Believe it or not, I owned EVERYTHING featured here. 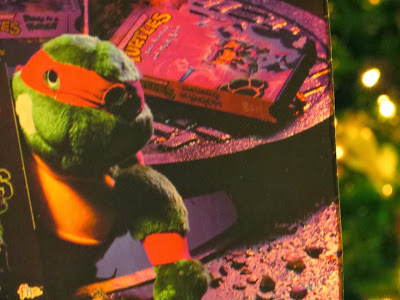 Even as an 8 year old, I could have grabbed the plush Raphael from my bed, setup my Turtle tapes, and made this ad myself. Despite the lack of Christmas creativity, this ad is snapshot from my pop culture past. 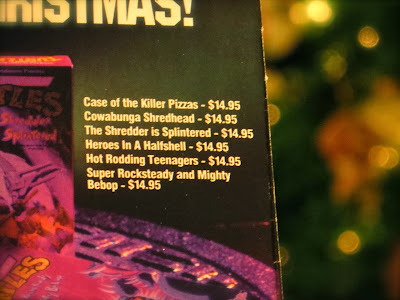 It showcases classic Turtles, old technology, and forgets to be politically correct (big franchises play it safe nowadays – “Happy Holidays” instead of “Merry Christmas”). The ad may not have much holiday spirit, but it rejoices in vintage glory. Make sure to return tomorrow for Day 8 of 24 Days of Turtle! Ah, the old vintage plush toys! Been seeing a couple 'round, it's nice to see how the franchise is really know just springing back to life. 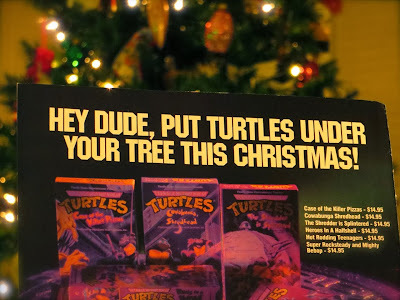 True, the lack of anything Christmas in it is a bit weird, but as long as it has turtles, I think I can be fine with it. 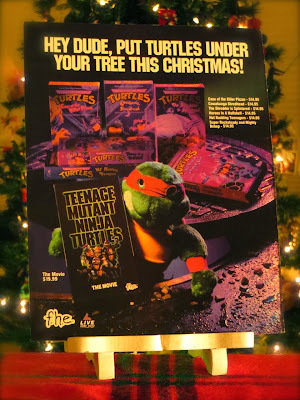 Besides, who wouldn't want to Turtles under a Christmas tree? It's the best surprise for anyone. Haha! That's a great point!! Unfortunately, I guess I don't own a manhole cover. However, I do have a plastic TMNT shield that looks like one. It's about 12 inches in diameter. Can that count? Of course! As long as it resembles one, it should count, anyways. Love the vintage ads, the sets were always really fun with minimal editing it seems.